If you haven't already, check out and do the survey in my last post. Oh, not that you asked, but I do approve of the new James Bond. Very much so. 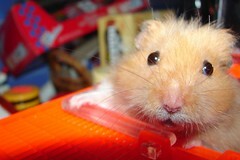 Ami is the cutest hamster ever!!! Hey I was going to say that! oh well. Once when I worked at a pet store a hamster bit right through one of my coworkers fingernails. She managed not to drop the hamster, I thought that was amazing--that she didn't drop the hamster. Thanks! I think he's the cutest too! Mini: I've actually never (*knocks wood*) been bitten by Ami. I did drop him the first time I tried to pick him up...he was so wiggly and I kind of freaked out. I thought I'd killed him, but that was nearly 9 months ago and he's still fine! The better to smell you with, Mr. Jones.